Amazing movie poster lithograph from Star Trek Into Darkness! The USS Vengeance in hot pursuit of the USS Enterprise. Gorgeous lithograph measures 40-inches tall x 27-inches wide! Vengeance is coming! As the massive USS Vengeance pursues the Enterprise, it clearly dwarfs the iconic starship several times over. 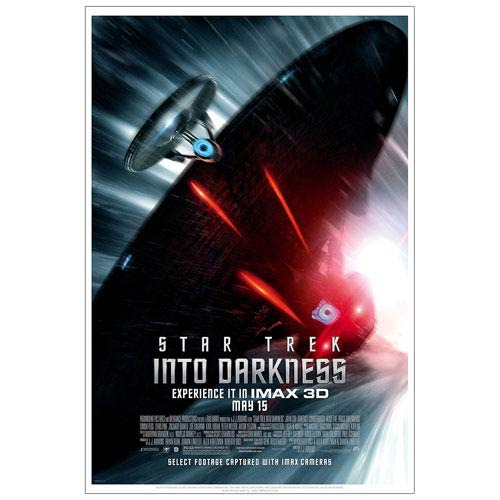 The dark ship is seen here in this Star Trek Into Darkness Pursuit Movie Poster Lithograph firing torpedoes at the Starship Enterprise during the chase. Complete with the Star Trek Into Darkness movie logo and measuring 40-inches tall x 27-inches wide, this amazing lithograph art print is a must-have for fans of the hit blockbuster film!